I would like to thank those who provided feedback in my quasi-nervous breakdown post about card collecting the other day. It was reassuring to read that some of you have at one point felt the same way, and refreshing to see words of encouragement. Words like happiness, simplifying, clarity, surprise, and enjoy, spoke to me. What exactly I heard, I cannot say yet. I am still processing where I want to go with this hobby, but I see light. As an aside, while I have been searching for direction, I realized what triggered my episode. As JediJeff inquired, yes, I am a completionist, and I am fighting that tendency because it is hopeless when it comes to card collecting. Unless I define what I deem complete, there will be no end. Never. 1,848 pages of pure, wondrous resourcefulness. 1,848 pages of crippling, debilitating incompletion. 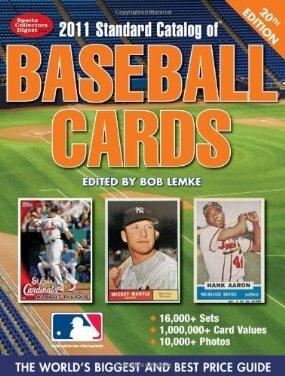 This catalog is by far the most detailed reference guide I have ever seen for baseball cards. I know, the internet has it all, too, but why pass up a real card for eTopps? In addition, I was able to land this behemoth for free with free shipping. A few weeks ago, I took a survey for my auto/home insurer and they sent me a gift certificate to Amazon. That certificate coupled with my Amazon Prime membership got me this catalog the very next day for free. Who could pass that up? I was also amazed/dejected at how many different types of baseball cards there are in existence. It was overwhelming and riddled me with anxiety. I can't possibly build those sets, but what else is there? I’ve always looked at other collectors and wondered, “How can you just collect Barry Larkin? How can you mix and match cards to create your ‘own’ sets? How can you collect plays at the plate?” It always seemed confining, and I always was a traditionalist. Build sets. Period. I think if the boom of the 80s, the antics of the 90s and the insert/short print mania of the 2000s hadn’t occurred, I could safely and easily complete sets the traditional way, the truly confining way. I have a tendency to be a "completionist" as well, but end up as a major "incompletionist". I remember when I first started to revise what I considered complete. And I'm still revising to this day. This hobby can be one of the most frustrating experiences, but can also be simple and fun. It's up to you what to make of it. Remember at the end of the day, no one is going to come into your home and grade your collection based on some standard. It's all up to you. What you want. I think anyone who's a set collector has gone through this at some point. Or maybe continually feels it to some level. I think what's maybe happened with you is that you had this idea, thought it would be really cool, and then once you dove in realized it may not be feasible since the card landscape has changed so much. That's definitely happened to me a bit. I do agree with most of the people who posted that it's good to step back and figure out what you want to collect. A little up front decisions can help keep you in the hobby! Well, there isn't much more to say! I don't do many sets but I want to get every Cleveland Indian card there is. I know I never will, but just the thought, and fun, of trying and searching keeps me going. BTW, I have used those catalogs for years, they are great. You didn't think I knew all those Leaf cards by heart did you ! I have an older edition of this book that I use on a regular basis. If it wasn't so big, I'd carry it around with me. By the way... my cardboard philosophy is constantly changing. Over the past 30 years, I've gone from buying packs of cards to find funny photos of guys with weird beards to hoarding rookie cards of Sam Horn. It cracks me up to see how many times I've changed my collecting focus, but that's the reason I started my blog. It's a way of documenting my life as a card collector... and of course a way to meet fellow collectors like you. I think a lot of collectors have adapted and adjusted over time. Whatever you decide to do, as long as it makes you happy... the blog world will get your back.